You are here: Home / News / Product Encyclopedia / How to Use Finger Oxiemter? How to Use Finger Oxiemter? 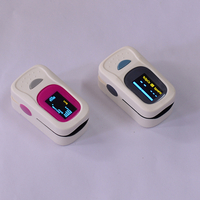 The finger oximeter(pulse oximeter) integrates the light sensing technology into the chip, do not need to collect human blood samples, monitors the current oxygen content in the blood through light infiltration. At the same time, the body pulse rate is detected. With a pen-based LCD announcement, the user can easily complete two tests at the fingertips at a glance. 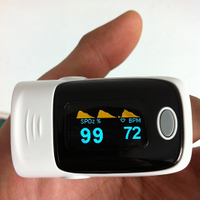 The finger oximeter is suitable for home, hospitals, oxygen bars, community health care, and sports care (can be used before and after exercise, not recommended during exercise). 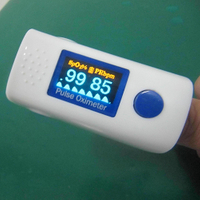 1.For the first time using the finger oximeter, press the Reset button and the LCD screen displays standby status. 2.Press the jaws. Insert the left or right middle finger into the work chamber (you can see the infrared light in the work compartment, note: the finger can't be clipped, the hand can't be wet, and the nail surface can't have impurity). 4.After 30 seconds, the jaws are released, the fingers are withdrawn from the work chamber, and the LCD freezes the test results. The %SpO2 at the top of the screen is the blood oxygen index. Min at the bottom of the screen is the pulse rate. From the medical analysis, the blood oxygen content (%SpO2) is greater than or equal to 95, which is a normal indicator; the pulse rate (/Min) is between 60 and 100, which is a normal indicator. If the values you have detected do not meet the above two indicators, please monitor them 2-3 times at different time points and maintain continuous monitoring for 2-3 days. If the values still do not meet the standard values, it is recommended that you go to the hospital for detailed treatment.